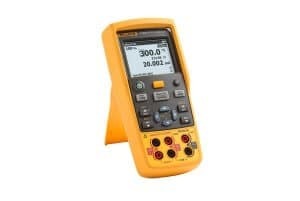 Fluke 712B RTD calibrator is an ideal test tool for the temperature calibration professional technicians that wants highly accurate, single function and easy to use RTD temperature calibrator.It is a single function tool used for maintaining the accuracy of the process temperature transmitters and chart recorders or testing input cards on process control system.It can also perform a narrow set of tests quickly with high accuracy. 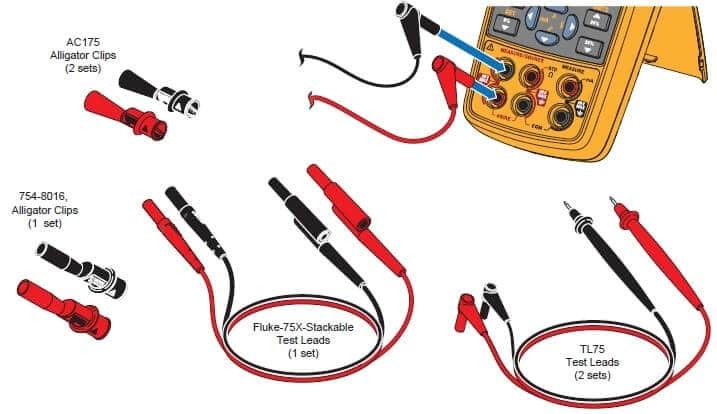 Let’s have some look over Fluke 712B RTD temperature calibrator features, accessories and measurements. Measures and simulate: 13 different RTD types and resistance. Rugged, compact design: backed by a three-year warranty. Dual input and backlit: For easy interpretation of results. Measures 4 to 29 mA signals. For quick 25% linearity check, it configures 0% and 100% source settings. Power down settings remembered at power up for the easy restart of tests. It has the hanging tool built into the case and included with every unit. 1-year and 2-year specifications bring flexibility to your calibration schedule. High precision instrument with single function functionality. Handles pulsed RTD transmitters with pulses >100 ms.
Measure, mA terminals Input terminals for measuring current. 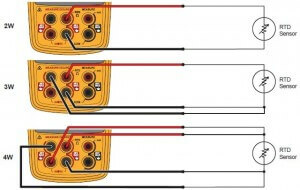 terminals Terminals for sourcing or measuring 2W resistance and RTDs. These both functions are used to save power.When we enable and disable these functions they will turn off the product automatically after a specified time. Press when SHIFT shows on the display. In the displayed setting list, highlight the Auto power off option, and then use to select this option. In the displayed setting list, highlight the Auto poweroff option, and then use to deselect this option. In the displayed setting list, highlight the Auto backlight off option, and then use to select this option. In the displayed setting list, highlight the Auto backlight off option, and then use to deselect this option. Fluke 712B RTD calibrator is used to measure temperature using RTDs in two modes i.e one is source mode and another is measure mode. At 0 °C, RTDs are characterized by their resistance and is also known as ice point or R0. This calibrator accepts RTD measurement inputs in 2-, 3-, or 4-wire connections, but mostly used the 3-wire connection. A 4-wire configuration provides the highest measurement precision while 2-wire provides the lowest measurement precision. For Measure mode, press this button if necessary. After selecting measure mode press this button. To select a 2-, 3-, or 4- wire connection press this button. Attach the RTD to input terminals as shown in Figure. Press this button to switch to Source mode on temperature channel. Press this button for RTD display. Use these arrow keys to define the simulated temperature value. Again Press this button for RTD display. For Measure mode press thus button if necessary. Press to select the temperature you want. Press to select a different digit to edit. If the Product display shows , the excitation current from your device under test exceeds the limits of the Product. 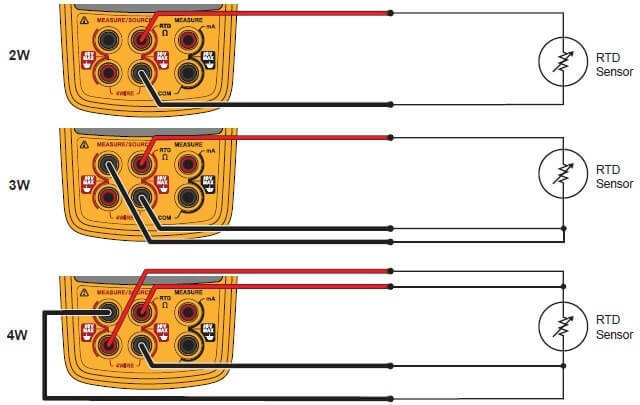 While ordering this calibrator, you got following additional components with it are shown below. If the Product is damaged or something is missing, you can contact the place of purchase immediately. Hope this article will help you. We always appreciate your suggestions.